Bracketing enables you to easily record the same image with your Nikon D3100, D5100, or D7000 at several different exposure settings. In addition to being able to bracket autoexposure and Active D-Lighting settings, you can use the feature to bracket white balance. You must set the Mode dial to P, S, A, or M. You can’t take advantage of auto bracketing in the other exposure modes. You can bracket only JPEG shots. You can’t use white balance bracketing if you set the camera’s Image Quality setting to either Raw (NEF) or any of the RAW+JPEG options. You take just one picture to record each bracketed series. Each time you press the shutter button, the camera records a single image and then makes the bracketed copies, each at a different White Balance setting. You can apply white balance bracketing only along the blue-to-amber axis of the fine-tuning color grid. You can’t shift colors along the green-to-magenta axis, as you can when tweaking a specific White Balance setting. 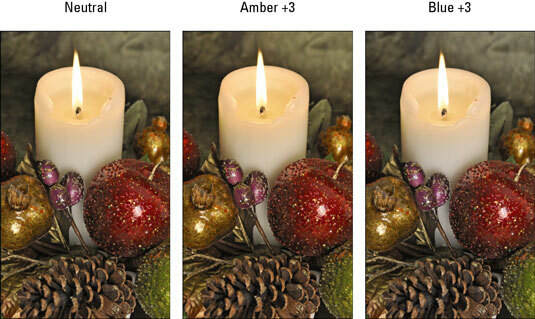 For each bracketed series, you get one “neutral” shot, one shifted toward amber, and one shifted toward blue. You can shift colors a maximum of three steps between frames. Set your Nikon DSLR to the P, S, A, or M exposure mode. Set the Image Quality setting to one of the JPEG options (Fine, Normal, or Basic). You can adjust the setting through the Shooting menu or Quick Settings screen. Display the Custom Setting menu, select the Bracketing/Flash submenu, and press OK. Select Auto Bracketing Set and press OK. Select WB Bracketing and press OK.
Use the Quick Settings screen to set the amount of color shift you want for your bracketed images. After displaying the Shooting Information screen, press the Info Edit button to get to Quick Settings mode. Then use the Multi Selector to highlight the BKT option. Press OK to display the WB Bracketing menu. Again, WB1 is the smallest increment between color temperatures, and WB3 has the greatest increment between color temperatures. 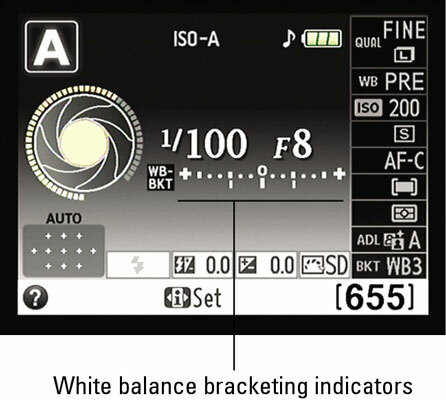 The Shooting Information display shows bracketing indicators, reminding you that white balance bracketing is in force. Again, each shutter button press actually produces three images; The first and third shots are the adjusted shots. In the camera metadata, you see A (1, 2, or 3) for the first shot and B (1, 2, or 3) for the last shot. The code tells you whether the image has an amber (A) or blue (B) bias and the level of adjustment you selected when setting your bracketing amount. Your bracketing option remains in effect even after you shut off the camera. When you’re finished taking the pictures that need bracketing, remember to disable bracketing. Just revisit the Quick Settings screen on your D3100, D5100, or D7000 and then set the BKT option to Off.